From Graz in Austria Brunner became interested in racing in his late teens thanks to the exploits of Austrian Jochen Rindt. He trained as a mechanical engineer and began his racing career working as a junior designer for the McNamara company. McNamara was the brainchild of expatriate American Francis McNamara and built a variety of Formula Vee and F3 cars in the small south German town of Lenggries, near Munich. There was even a McNamara USAC car but it was not a success, although the McNamara F3 cars were run for Niki Lauda and Gerold Pankl with some success. In 1971, however, McNamara mysteriously disappeared and his team closed down. Brunner continued his apprenticeship in Germany and in 1978 was hired by the fledgling ATS F1, owned by mercurial German Gunther Schmid. The relationship was short-lived and Brunner moved on to work for Willi Maurer in F2. The Maurer F2 designs proved to be quite successful in the early 1980s in the hands of Roberto Guerrero, Eje Elgh and Stefan Bellof. In 1981 Brunner designed the Lotec-BMW sportscar but was then tempted back to F1 by Schmid to design a ATS-BMW for Manfred Winkelhock. The cars were quick but unreliable and at the end of 1984 ATS closed down and Brunner moved on to John Macdonald's Skoal Bandit-sponsored RAM-Hart team with Winkelhock - although Manfred would be killed in the mid-season in a sportscar race. 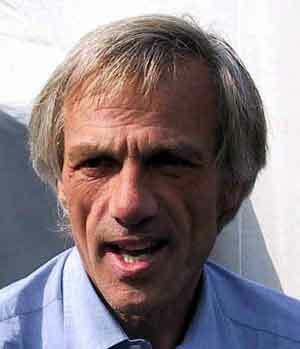 At the end of the year Brunner was hired by Ferrari to head the design team of the F187, with which Gerhard Berger won the Japanese and Australian GPs in 1987. His position was undermined by the arrival of John Barnard and in 1988 Gustav designed an Indycar - which never ran - and then left to join Gunther Schmid's new F1 team - Rial. He designed what was soon known as "the little blue Ferrari" but again fell out with Schmid and moved on to Zakspeed, where he designed the Yamaha-engined 891 chassis. The engine was a disaster and Zakspeed went out of business, leaving Brunner to move to the Leyton House-March team where he worked under Adrian Newey in 1990. He became chief engineer after Newey was ousted and technical director when Newey's successor Chris Murphy was fired. March was struggling financially and so the frustrated Brunner moved on to Minardi for 1993, only to be poached after half a season by Ferrari. He stayed at Ferrari for five seasons but in February 1998 he moved back to Minardi to become the team's technical director. In early 2001 Brunner was poached by Toyota and led the design team in Cologne until the end of 2005.